Hey all! Happy wonderful life Wednesday! 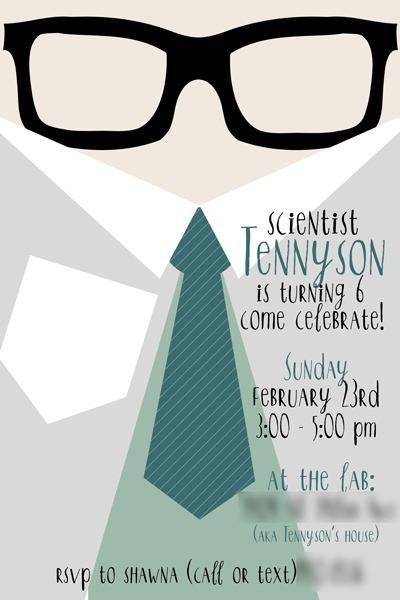 This week I just wanted to show off the awesome party we threw for Tennyson last week. 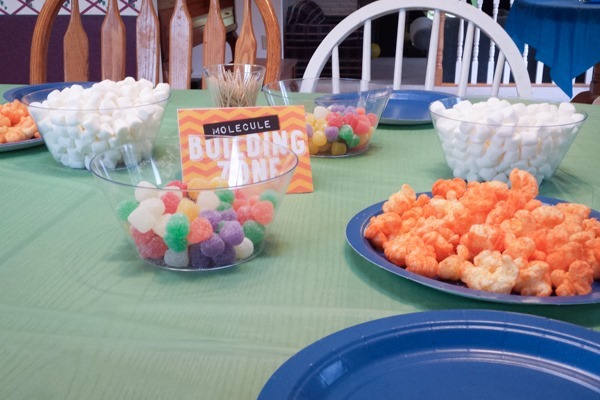 After much indecision, Tennyson finally told me “you just pick” when I asked what type of party he would like. 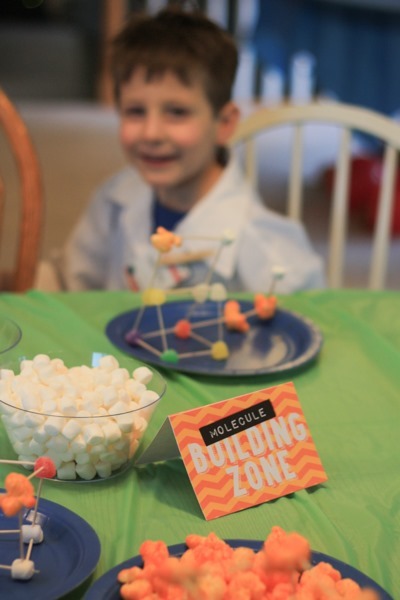 Lately Tennyson has been saying he is a scientist when he talks about what he wants to do when he grows up – so I thought it would be fun to play on that theme with our very own science party! 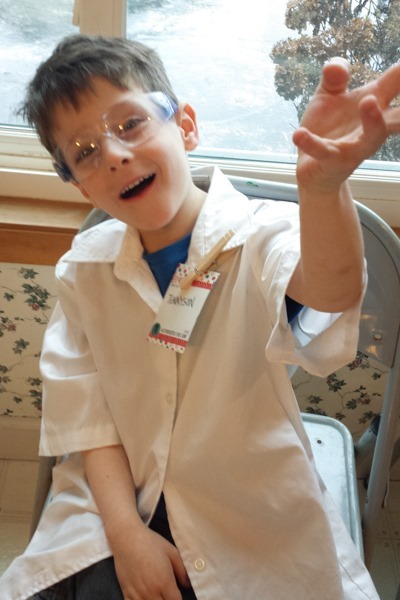 Here is our little scientist all ready to party 🙂 he had a lab coat in his dress up costumes so he wore that, and a pair of the safety glasses we got for all of our guests. 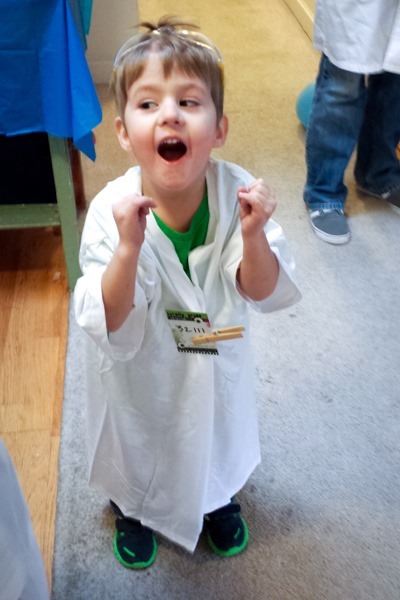 For everyone else we had a bunch of men’s small white t’s that I cut right down the middle – instant kids’ lab coat! 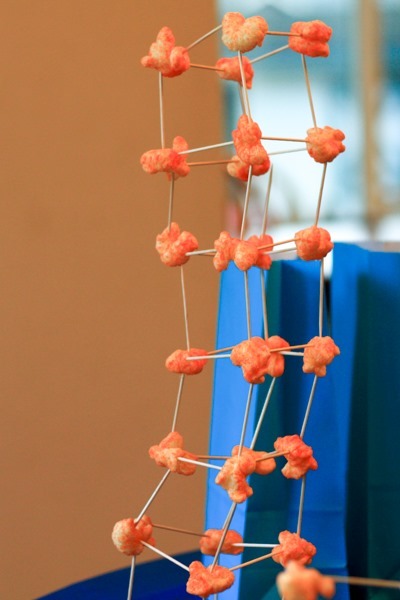 This was SUCH an easy activity to set up and it really captured the kids’ interest! They probably would have done it for an hour if we had the time! 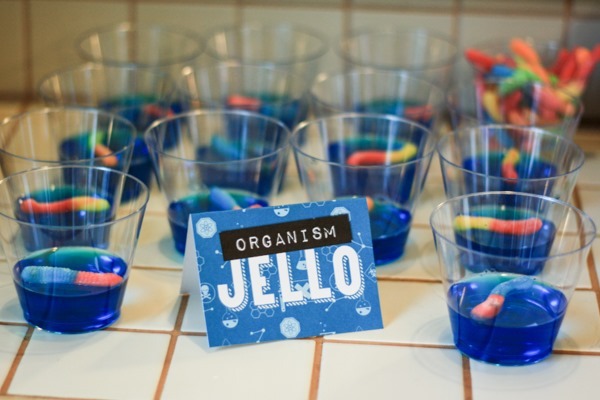 It worked out perfectly to put little glass jars about 1/3 full ontop of plastic plates that were a little bit deeper than normal plates – I got these at the dollar store, and then spread a few bowls with baking soda and spoons on the table. 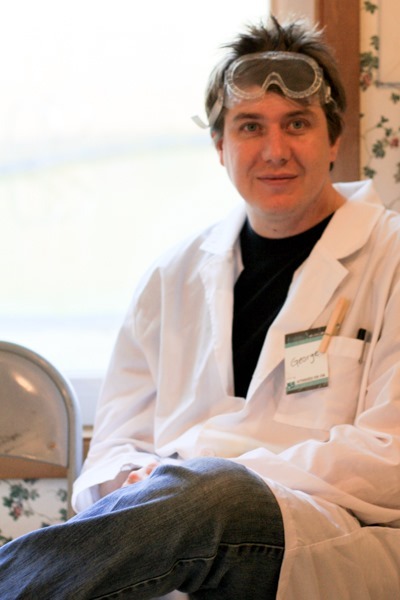 After the kids had their vinegar, all they had to do was slowly scoop baking soda into their jars. 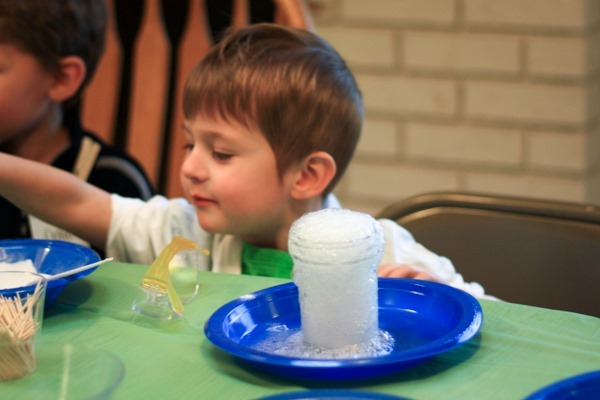 Instant volcanoes, and instant awesomeness! 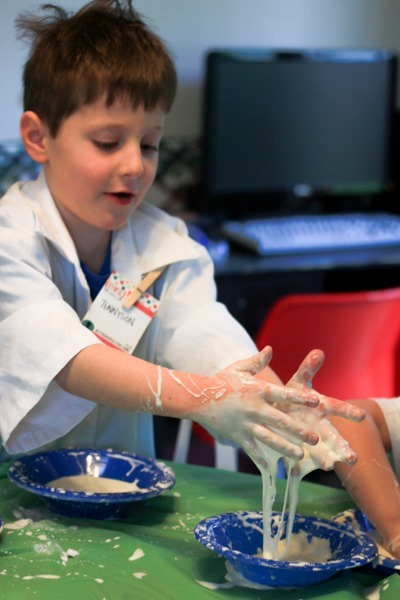 We poured a bit more vinegar in their jars after the first explosion so that they could make it erupt again, easy peasy and super low mess – the kids loved being able to make their own explosions and not just watch someone do it for them. 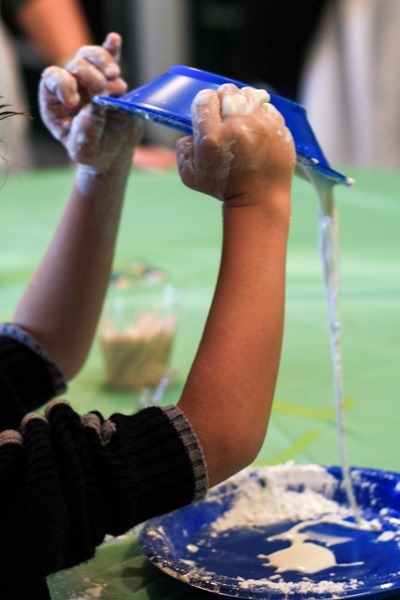 The third activity was probably the party favorite – we got out the cornstarch and water and made our very own “Oobleck”. 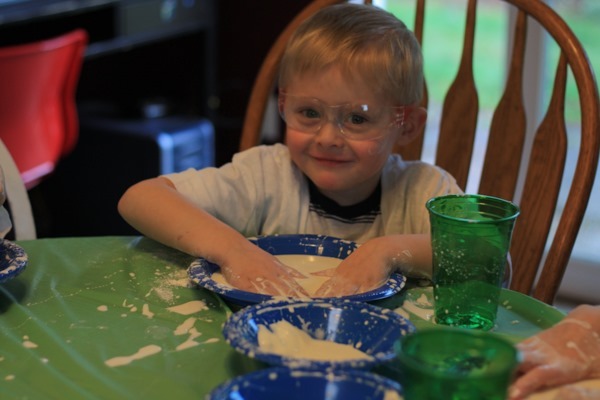 I set out bowls with dry cornstarch in it, and a little plastic cup of water for each kiddo (once again I used those handy deep plates underneath to catch the spills) – and all they had to do was add the water and start mixing it with their fingers – it was so cool watching and that stuff is pretty cool! 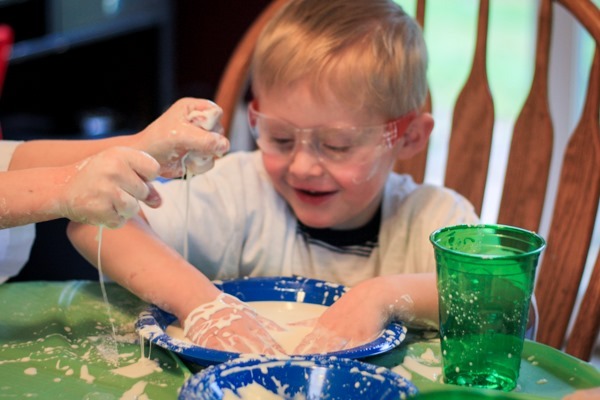 The kids were all very excited too because they each had their own unique combination of water and cornstarch so they all kind of did different things. 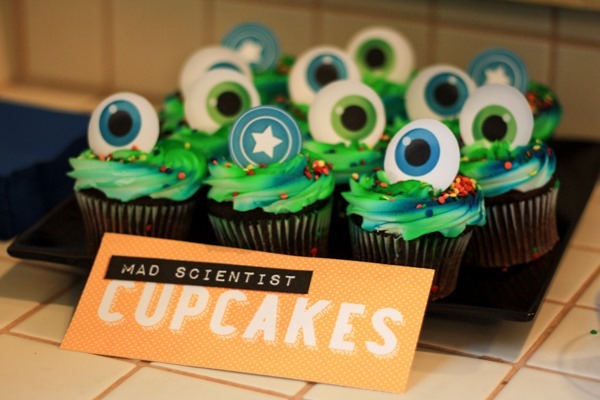 For snacks and such I kept it super easy and just bought store cupcakes – however I replaced the little ring toppers with crazy eyeballs that I printed and cut from the digital kit “Weird Science” (Traci Reed, SweetShoppeDesigns). The kids thought they were hilarious, and the Clingerman boys tried to convince everyone they were real eyeballs, then, in a moment of excessive craziness, Tennyson tried to convince everyone he loved eyeballs by actually eating the paper eye – ewwwww…. 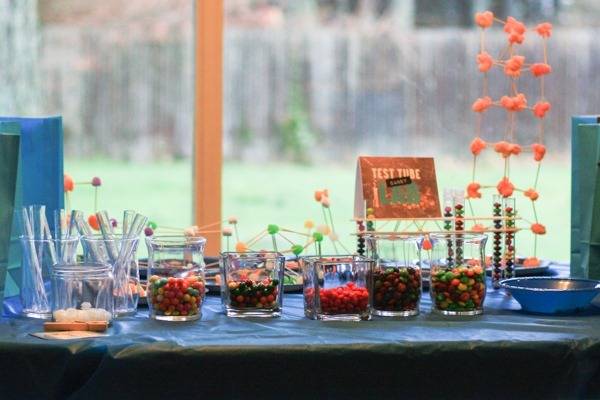 It turned out so fab and I seriously was able to plan/shop and prep for this party in just a day (save the amazon eye wear that I luckily had the foresight to order in advance!). 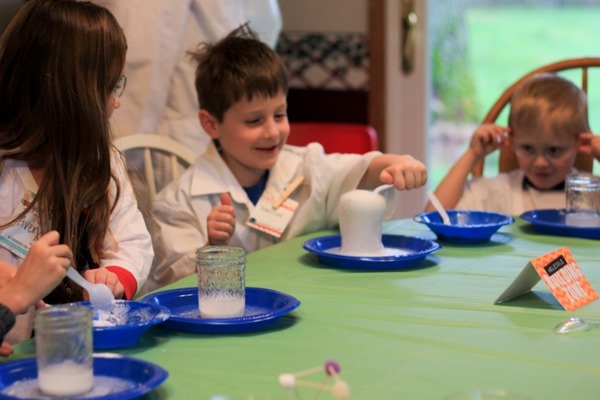 Everyone left happy and with a fun little assortment of goodies including their “lab coats”, safety glasses, and candy test tubes. I couldn’t have pulled it off with out my handsome lab assistant. So! 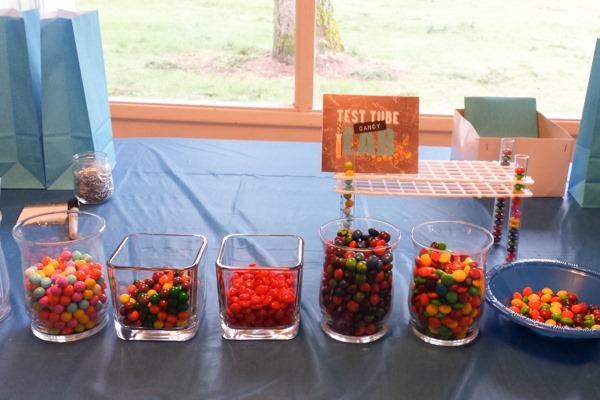 There you have it: a simple and fun science party! 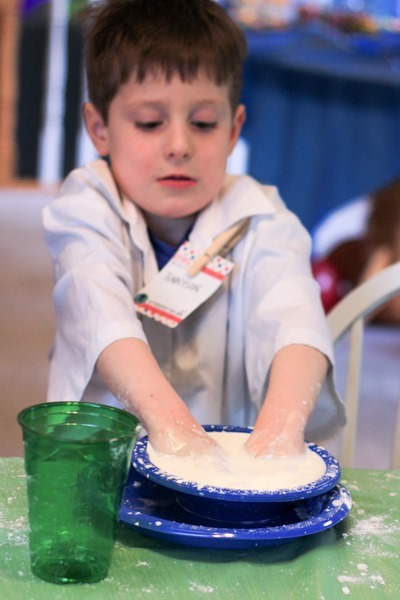 If you want to have a hands on, fun and easy to plan party I say go mad scientist all the way! I def. should give a shout out to Pinterest for most of these lovely ideas, plus about a zillion more that I didn’t have time to do! You can see these ideas and other party ideas that have inspired me on my Birthdays and crafty-party boards on Pinterest. 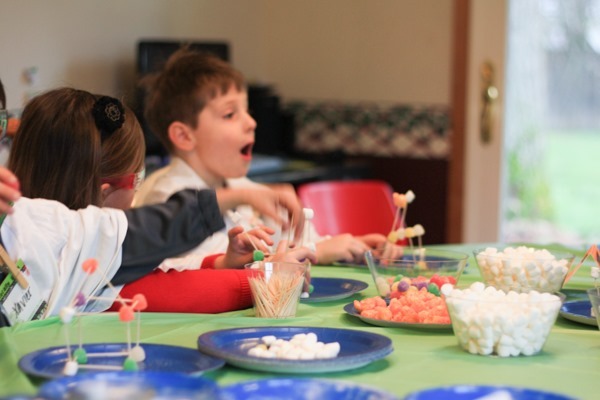 I absolutely LOVE throwing a fun party but it has been a struggle the past few years in our smaller house – even if we just add 3 guests to the list – with my own kids added in there are already 7 of them (plus 2 more for the cousins!)! Now that we have the space I’m so excited! 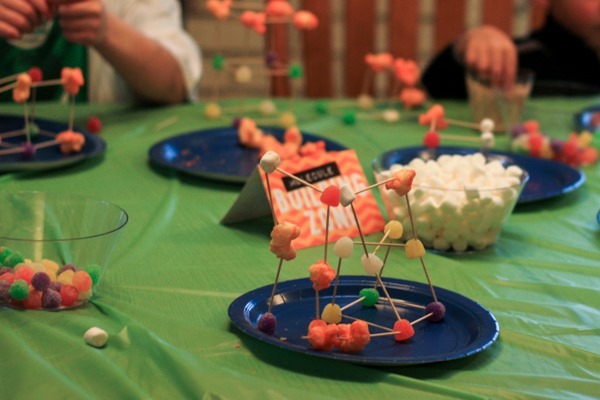 3 more birthday parties to throw this year so I’m always browsing for and pinning clever ideas I find! 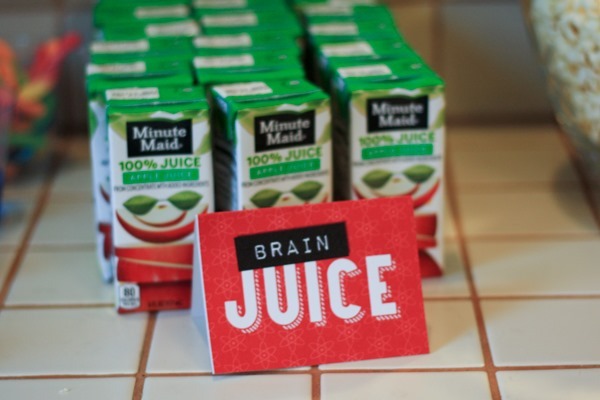 Thanks for stopping by this Wednesday for a little slice of my life – be sure to subscribe to this blog on the right too if you want to be notified of posts – my creative team has been knocking my socks off with brilliant inspiration and tutorials – plus there are freebies and ways to win free kits regularly as well!